Spaghetti is such an easy meal, in so many ways. It’s very popular, it’s easy to heat up some sauce and to boil some noodles, and of course throwing some garlic bread in the oven. I honestly don’t remember ever hearing someone say “Eww!” when they heard they were having spaghetti for dinner. Shoot, the two meals that my brother is able to cook includes spaghetti and hamburger helper…and spaghetti is always a winner! One thing I have noticed about the jar of spaghetti sauce you buy at the store tends to have a watery texture to it. Some more so than others, but it’s still there from the jar sauces I’ve had. That was one of the several differences that I noticed about this sauce…no watery texture! 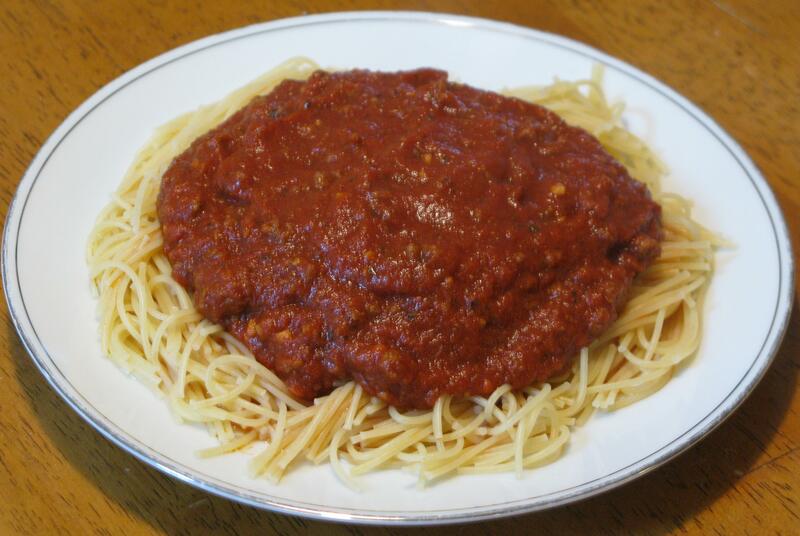 Although the jar of spaghetti sauce is super easy and convenient to make, I still wanted to make my own sauce from scratch (less preservatives, and I knew exactly what herbs and flavors were going in). But, I also didn’t want to have to spend an hour preparing the sauce every time I make it, so making a batch and then freezing it in individual freezer safe mason jars was the way to go. Since the jars at the store are typically 24 oz, that’s the size I decided to store this sauce in. 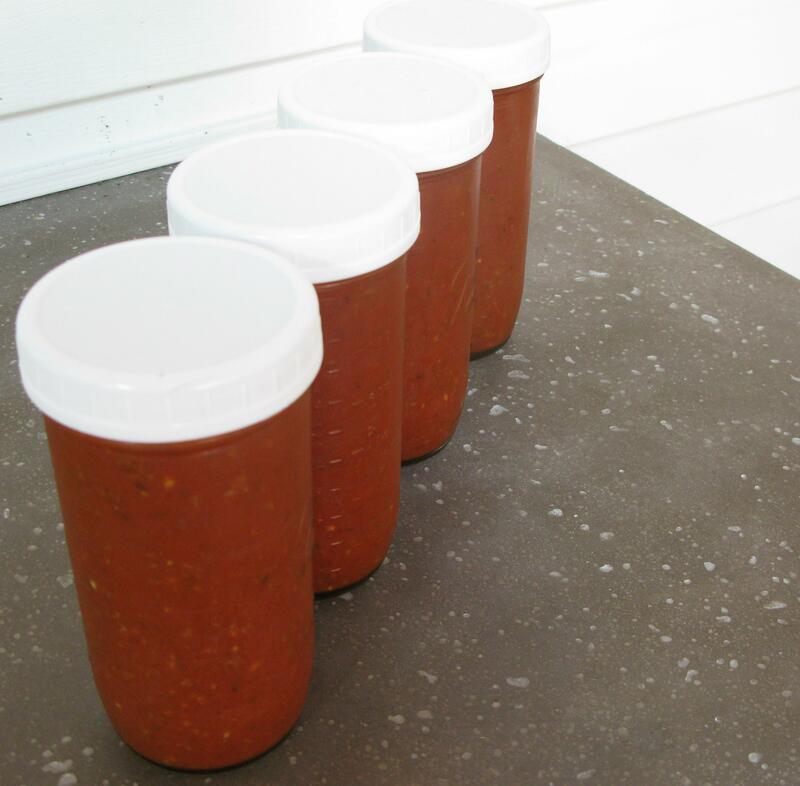 Of course, you always have the option to store your sauce in larger or smaller containers. These jars come with the metal lids, but I also got the plastic lids for easier access, and just because I prefer them. This batch fills up about 2 1/2 of the 24 oz. jars. Typically, I like to double the batch and fill up 5 jars, just so I have to make the sauce a little less often. Just make sure you have a big pot for it! When I distribute the sauce in the jars, I let them sit out on the counter (uncovered), to cool for about 1-2 hours before putting the lid on and sticking them in the fridge. After they’ve gotten cold in the fridge, I decide how many to put in the freezer to use at a later time. Don’t forget to put sticker labels on your jars so you’re not scratching your head, trying to figure out if they’re still good to eat or not! You can store the prepared sauce in your refrigerator for up to 7 days, and up to 6 months in your freezer. When you decide to take a jar out of the freezer to thaw, just make sure you do this the night before, and let it thaw in the refrigerator. What’s great about the prepared sauce is that you can use it for more than just spaghetti…you can also use it for baked ziti and lasagna. If using for spaghetti, just reheat in a pot. My cousin loves to throw extra meatballs in her sauce for her family, and I’m a huge fan of that as well. With frozen meatballs, you can microwave them according to the package directions before putting them in, or let them cook in the sauce for at least 30 minutes. Personally, I just throw mine in the microwave to make the process a little faster, but that’s totally up to you. you can also add some extra parmesan to your sauce…because you can’t go wrong with cheese. If you want to make a vegetarian version of this sauce, just replace the ground beef with 1 lb. of chopped vegetables of your choice (typically in this kind of sauce, I think of onions, green bell peppers and mushrooms). If you do this, just make sure you add 1 tablespoon of olive oil and cook the veggies first, before adding the sauce. Cook the beef in a large sauté pan or other pot (I use a stock pot when doubling this recipe). When beef is fully cooked and browned, add all of remaining ingredients. Cover and cook on low/medium heat, and stir occasionally for about 1 hour. Serve immediately, or store in individual containers in refrigerator (for up to 7 days) or freezer (for up to 6 months).